‘Huns’ – the very word brings up of reveries of hordes of horsemen swarming upon the resplendent Roman Empire, with their unkempt appearances, cacophonous intensity and ferocious ambitions. Well the historical truth is very different from this biased depiction heaped upon by the Christian chroniclers of the time. In fact, in spite of their branding as being “scourges of God’s fury”, it still remains a mystery when it comes to the origins of the Huns. For example, early 19th century historians equated these nomads with the equestrian Xiongnu tribes who were driven by the Chinese from their borders in 4th century AD. 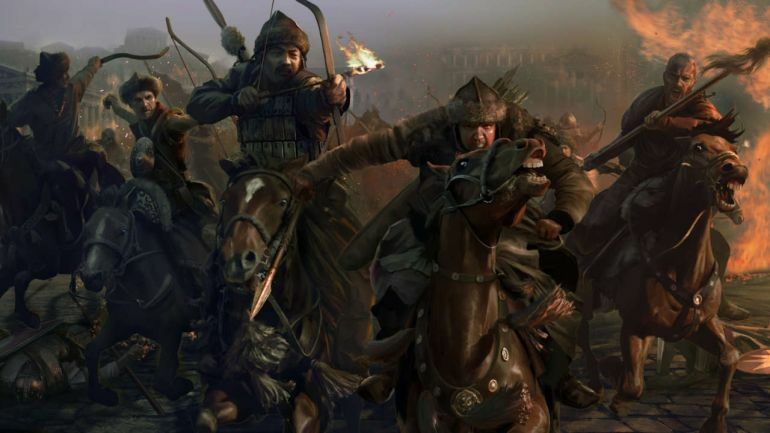 However, modern historians tend to place the geographical origins of the Huns in a more westward territory that roughly corresponds to modern-day Kazakhstan. In any case, one thing remains certain – the Huns were far more advanced and adept than their naive ‘barbarian’ label suggests. As we mentioned before, the popular notion of the Hunnish hordes sweeping across Europe is a misleading one. How so? Well, the Huns didn’t pertain to some kind of a singular tribe whose occupation was solely based on pastoral activities. On the contrary, the Huns (and their dynamic sub-tribes) had been neighbors to agrarian societies for centuries, and as such had adopted many of the cultural customs of sedentary people, including the Germanic populace of Europe and the Iranian Alans of Asia. In essence, they developed a system of wealth distribution (that also entailed tributes), which in turn allowed many of their elites to purchase valuable objects and ‘pleasures’ – thus mirroring their civilized counterparts. In fact, according to Priscus of Panium, who was one of the very eyewitnesses during the Hunnish-Roman conflicts, Attila himself resided in a sort of established ‘large village’, which had wooden enclosures, walls, towers and even a Roman-style bathhouse for the nobles. Such literary sources are also complemented on the archaeological level – with evidences of well supplied Hunnish villages on the Hungarian steppe. Such settlements tended to have rudimentary defenses of wattle-and-daub walls, while being strategically connected to proximate agricultural lands. 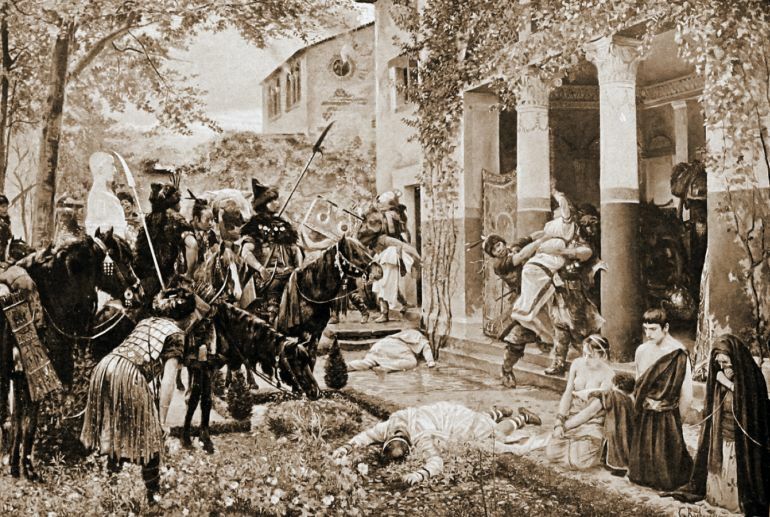 Once again, contrary to popular portrayals, there is no evidence to suggest that Attila schemed to have his brother Bleda murdered. 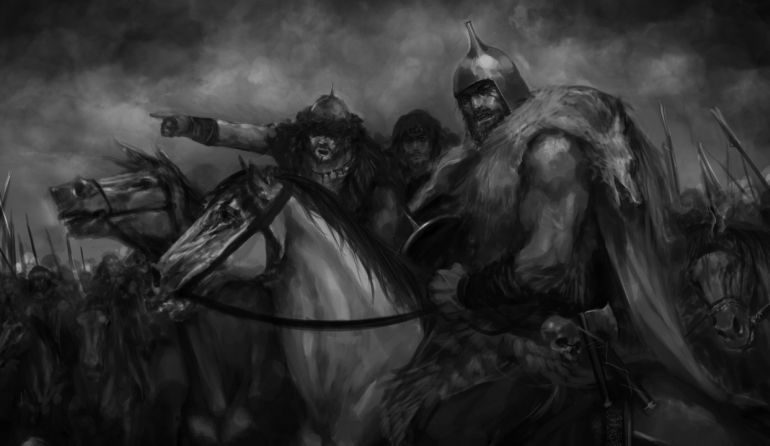 Furthermore, while Attila was known for his war-mongering attitude towards his rivals, his dare-devilry and warrior ways gave way to strategic generalship after his ascension on the throne. In other words, Attila was known for his planning and their fruition, rather than leading the charge on the European battlefields. One such example of his cunning and strategic acumen comes from the years of 443 – 441 AD, when the Huns successfully invaded the Balkans by taking advantage of an ongoing conflict between the Eastern Roman Empire and the Sassanian Persians. In the following year of 447 AD, his army reached the very walls of Constantinople, this time taking advantage of a massive earthquake that devastated Anatolia. As for his lifestyle, Attila was known to abhor riches like gold artifacts and expensive attires. Instead he still clung on to the hardy steppe-inspired life, by wearing plain clothes, eating in wooden utensils and totally discarding bread. Some authors (including Priscus) also noted his paranoid behavior and capricious tendencies – personality patterns that are hardly surprising given the prevalence of schemers and conspirators even in his court. However, Attila’s greatest ‘fault’ was probably his appearance and cultural bearings – factors that were alien (and even distasteful) to the majority of his European foes. Oddly enough, in spite of their seemingly nomadic credentials, the Huns under Attila were already becoming sedentary – mostly due to the majority of the Germanic subjects under their rule. Moreover, the ‘hordes of Huns’ – according to historical evidences, was at best propaganda and at worst biased lies. As was often the case in many historical scenarios, many ancient chroniclers had accentuated the numbers of the Huns to justify the Roman defeats (or to glorify their rare victories). In fact, according to most anthropological accounts, the invading Huns only formed a thin minority of the societies they conquered. In other words, these so-called countless hordes very rarely amounted to tens of thousands of Hunnish horsemen. Furthermore, from the logistical perspective, the Huns were not exactly an agricultural society (though often augmented by agricultural settlements). Their primary economic activities often involved herding, hunting and seasonal food-gathering – all of which require very large regions of grazing lands and hunting grounds. Unfortunately for the Huns, the European landmass was simply not big enough for such expansive steppe-inspired economic scopes. Such conditions meant that the Huns had to travel and raid in smaller groups, thus throwing a wrench into the whole ‘horde’ portrayal. While the Huns were known for their love of the traditional steppe concoction of koumiss (fermented mare’s milk), they generally tended to avoid plain water. However more brutal (and rather practical) was their preference of any kind of meat – including horseflesh that was usually derived from their mounts. In essence, the horses sometimes served as ‘moving rations’, by providing the Hunnish warrior with milk, meat and even ‘nourishing’ blood, especially when they tended to raid over large distances. 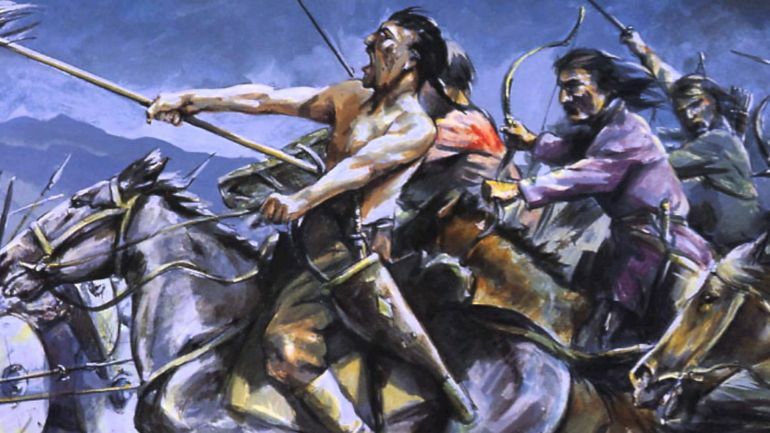 During shorter raids, the Huns depended on their expertise in hunting, thus mostly consuming game meat – which was often boiled and then dried without salt. Simply put, a small group of Hunnish warriors acted as a self-sufficient unit that tactically functioned without requiring any unwieldy supply line. While the Huns preferred to cut back their hair to the temple region, it was left to grow (usually dirty and unattended) along the back of their head. However, such ‘hairy’ features were only limited to the head portion, since most Hun warriors shaved their cheeks. This served a ritual purpose, with the soldiers intentionally scarring their cheeks to conform to their societal warrior codes. In some cases, the wounds were made deep (according to Jordanes, a 6th-century Roman bureaucrat) to supposedly mourn the loss of their fallen brethren in battles – with the scars symbolizing the tears of blood instead of ‘womanly’ tears. 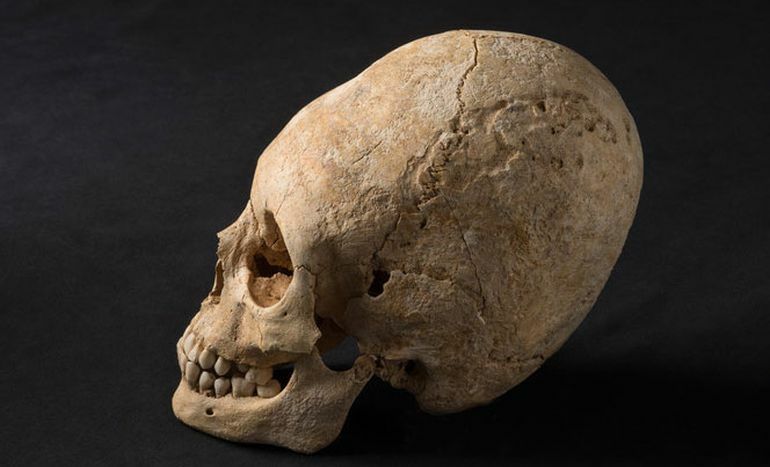 The interesting feature of the Hunnish warrior was their practice of cranial deformation – which was usually achieved by binding the head from childhood (when the skull tends to be soft yet growing). Similar practices were also observed in other ethnically different nomadic groups, like the Sarmatians. However, the historians are still puzzled by the Hunnish practice, since almost no contemporary record of such rituals are found from literary sources (which contradict the existing archaeological finds). This had led to the hypothesis that perhaps the practice was only prevalent in the elite groups of the Hunnish society. By its very nature, the design of a composite bow pertains to an elaborate arrangement of materials that can resist the forces of both stretching and compression. The steppe dwellers improved upon this design scope by incorporating ‘specialized’ animal materials that had the apt mechanical properties. For example, sinew is known to have almost four-times greater tensile strength that wooden bow, while the complementary horn has enviable compressive strength. Furthermore, the Huns added notched extensions made of bone or horn (generally sourced from steppe longhorn cattle) to the limbs of the bows – thus endowing them with far greater rigidity than conventional wood can offer. These engineered extensions even had their tactical value, as they allowed the archer to bend and draw a heavier bow with lesser physical effort. And, since we brought up the action of drawing the bow, the Huns were also known for using different arrows for hunting and battles. In case of battles, they preferred to carry arrows with blades that were both stocky and broad, while their shoulders were kept hooked. This made the delicate process of extracting the arrow from an enemy’s body very difficult, which often resulted in extensive blood loss. Much has been said about the excellent horsemanship usually demonstrated by the Huns (in both battles and hunts), and perhaps some of it can be ascribed to their use of stirrups. 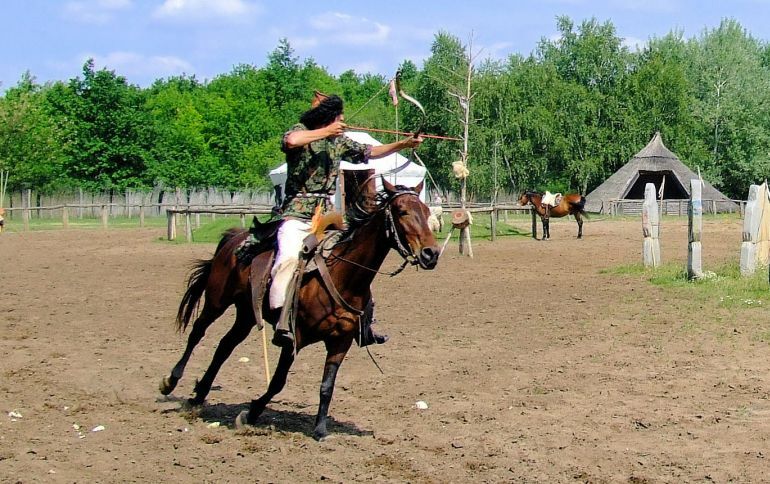 There is certainly a tactical side to this horse equipment, especially when the horse-archers used both their hands to release the arrow from the sturdy composite bow. During such an action, the entire momentum of body had to be supported by the legs, and they in turn were probably ‘anchored’ to the stirrups. Moreover, the support of legs also allowed the horseman to keep a correct posture during riding, and that helped in keeping up the warm blood circulation in very cold conditions. But in spite of such advantages of the stirrup, its role has been possibly overstated in the case of Huns. We say ‘overstated’ because no particular type of stirrup can be specially attributed to the Huns – on basis of archaeological evidence. 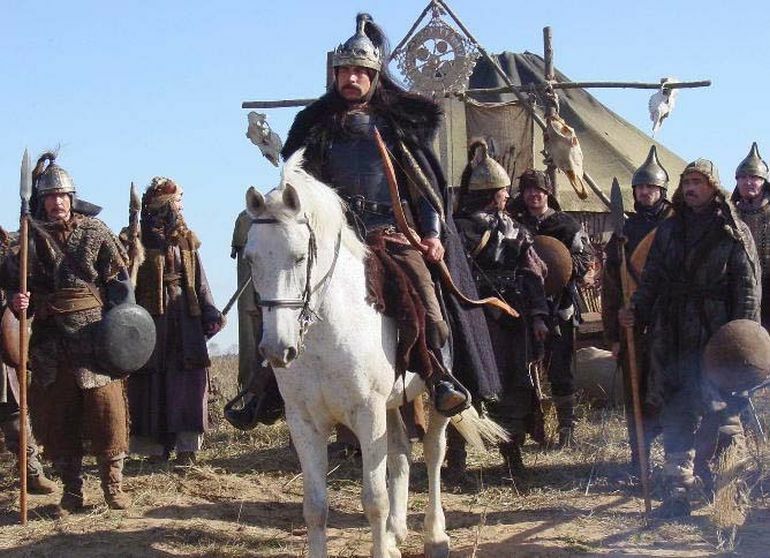 However, their successors – the Avars, were known to use stirrups by 7th century AD (as is evident from their grave artifacts), and possibly introduced this support equipment to Europe. 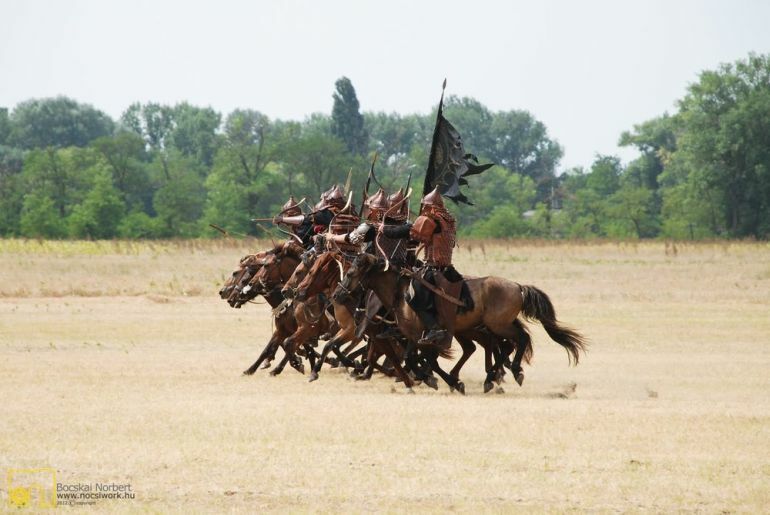 So, in that regard, while stirrups might have played their role in battlefield tactics, the Huns also took advantage of their intrinsic skill in horsemanship, thus making them superior in mobility to European forces. Agility was the cornerstone of every steppe dweller’s battlefield tactics. The Huns improved upon this scope of flexibility by using their loose formations to surround the enemy. However, they tended to avoid melee combat as much as possible in the beginning stages of the conflict; instead relying on precise missile barrages that affected the foe both physically and psychologically. And to ‘complement’ such an intense scenario, the Huns intentionally made harsh and guttural sounds that caught the enemy unawares, thus endowing an illusion of Hunnish ferocity and ‘barbarism’. But where the Huns truly excelled was their execution of the seemingly disparate tactics that more than often confused the enemy forces. As Ammianus gave an account of how the Hunnish horsemen quickly divided themselves into scattered bands from an organized formation. Then they rushed forth into various directions of the Romans almost in an disorderly manner, which rather baffled the foe. But this was a trick that simply epitomized the ‘order in chaos’ dictum; and the Huns aptly overcame the Romans by their aptitude in archery and suddenness in charges. Book Reference: The Hun ‘Scourge of God’ AD 375-565 by Osprey Publishing.